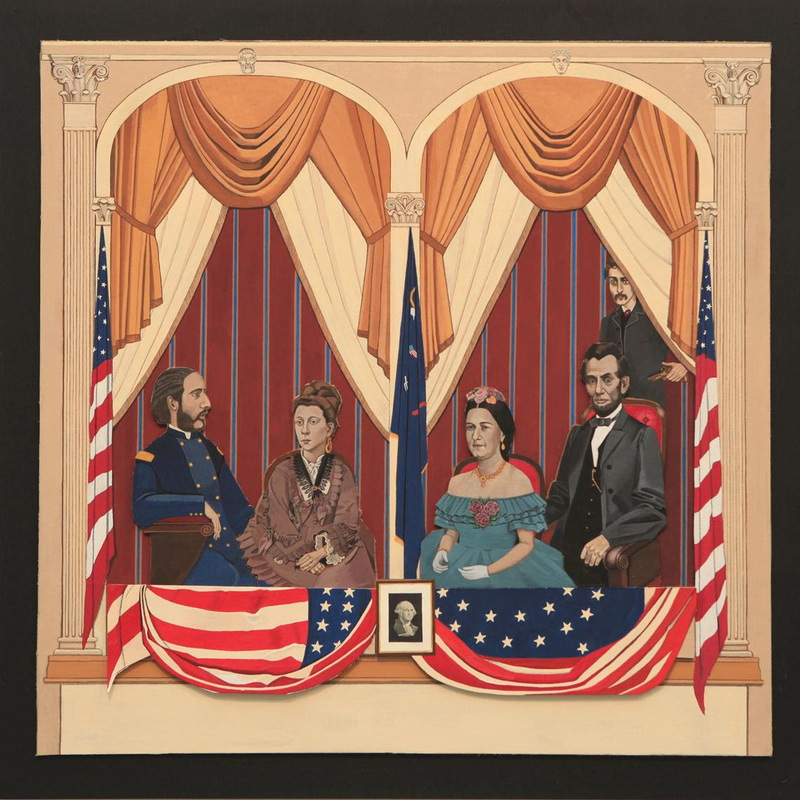 Beth Foley, Other Than That, Mrs. Lincoln, 2015, gouache on cardboard, 30x30.5"
David Lusk Gallery - Memphis announces a summer exhibition, Mash-Up: Artists Do Cardboard. Curated by Kristina Colucci, Mash-Up brings together 22 artists from across the South to showcase how artists can change the value of an ordinary material. Corrugated cardboard accounts for more than half of all the paper recycled in the US. The versatile material is appreciated by artists and makers for being strong, light, inexpensive, and recyclable. And it is everywhere. Considered a temporary packing and shipping material destined for the landfill, in the hands of artists, cardboard is transformed. Historically, the Chinese are credited with creating the first cardboard in the 1600s and the first cardboard box was created in England in 1817. 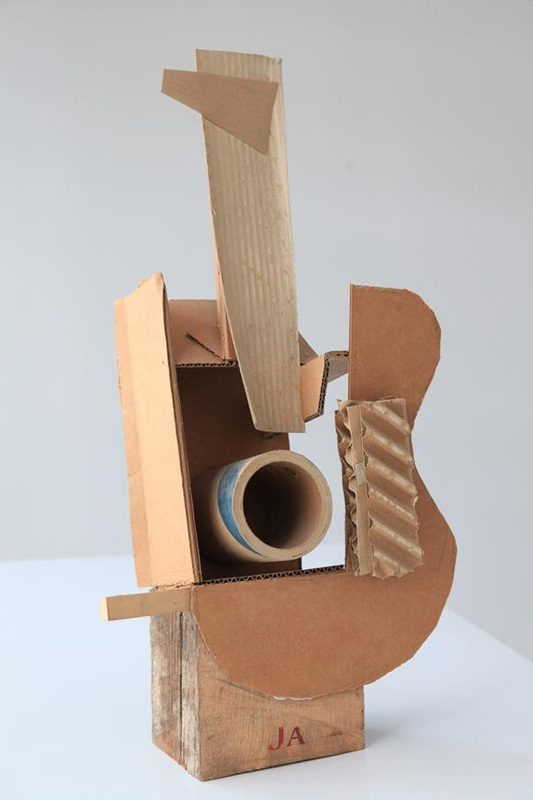 Jimmy Abegg, Guitarismo, 2015, cardboard, wood and nail, 26x14x5.5"
For this exhibition, Colucci recruited a selected group of artists to each make a work of art using cardboard. The only stipulation: use cardboard – a little or a lot. “I want Mash-Up to be anything goes, springing from the cardboard starter,” said Lusk. Mash-Up includes many arts educators, gallery and museum employees, and other full time art makers. All 22 artists were excited to participate in the challenge; some of them were already working with cardboard as part of their regular practice. Artists featured in the exhibition:Adrienne Outlaw, Alicia Henry, Beth Foley, Billy Renkl, Brandon Donahue, Dane Carder, David Comstock, Erin Harmon, Greely Myatt, Hans Schmitt-Matzen, Herb Williams, Jimmy Abegg, John Folsom, Kit Reuther, Kirsti Hargrove, Kristina Colucci, Lain York, Leslie Holt, Scott Fife, Tad Lauritzen Wright, Tyler Hildebrand and Vadis Turner. Through the lens of openness, inclusiveness, and fun, Colucci aims to encourage viewers to consider what we throw out, what we value, and what artists can do to change the world a little at a time. Mash Up: Artists Do Cardboard is on view. The opening reception is from Sat 17 July from 6-8pm.6-8 p.m.
David Lusk Gallery – Memphis is TEMPORARY LOCATION AT 64 FLICKER STREET. Gallery hours are Tue-Fri and Sat 11-4. For further information or visuals, contact Brittney Shedden at 901-767-3800 or brittney@davidluskgallery.com.